After all this time of speculations and rumors a first preview of the new SharePoint 2013 (or SharePoint 15) has been released for testing and evaluation. A first shy glance on the hardware requirements is confirming what I supposed. For a web or application server in a three-tier farm which is used as pilot, user acceptance test or production environment of SharePoint Server 2013 preview, 12 GB RAM, 64 bit 4 core processor and 80 GB system drive space are needed. In my Hyper-V test environment I am running SQL Server 2008 R2 SP1 on 4 cores with 8 GB RAM. 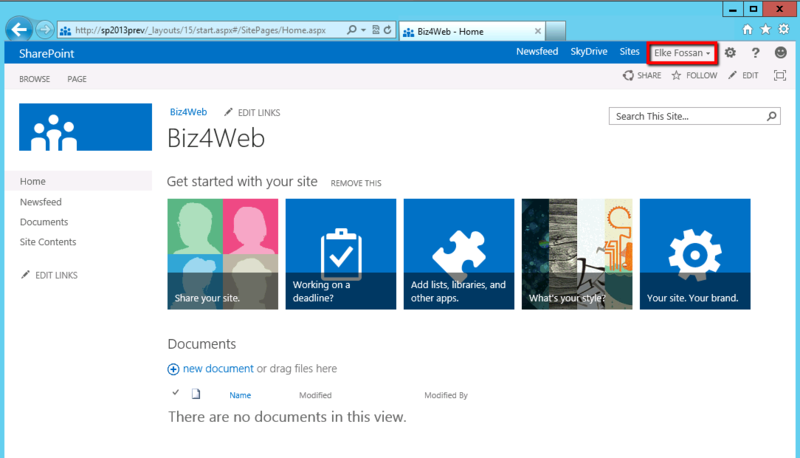 The same for SharePoint Server 2013 preview, App and FE Server on the same machine. In this configuration everything is going smooth and without performance issues, anyway. The installation process follows the same procedure as in the former versions. In the first step, you have to install the prerequisites. 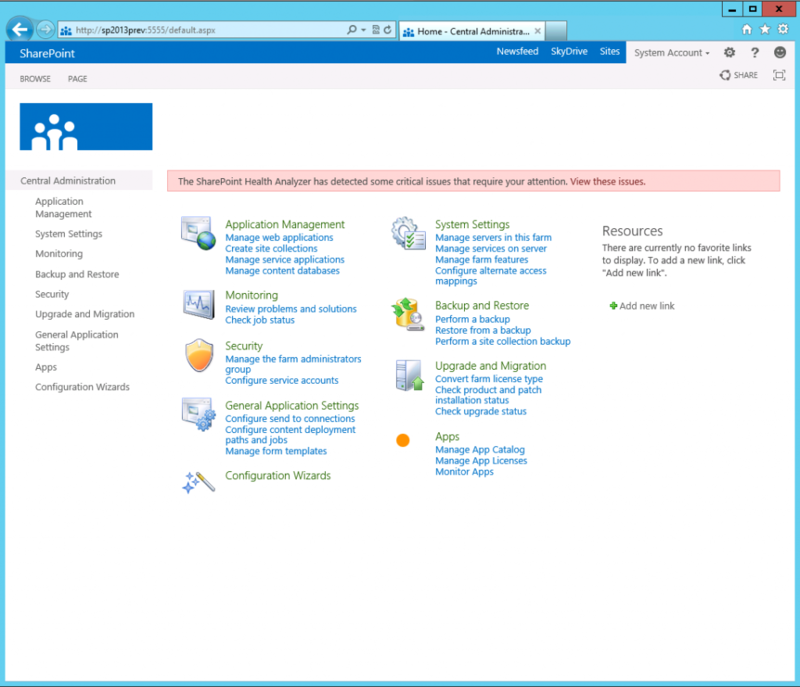 One remarkable new item in the list is “Windows Server App Fabric”. We will hear more about that later. For those of you who missed to note down the key during the software download, here it is: 6RNT8-XV26M-GWH36-VMGQH-94MMH. After the installation of the prerequisites it is important to install the following hotfixes in case you are using Windows Server 2008 R2 as operating system and Internet Explorer 7.5. In my evaluation environment I am running Windows Server 8 Beta, which comes with Internet Explorer 10 per default. Another important prerequisite is SP1 for SQL Server 2008 R2. 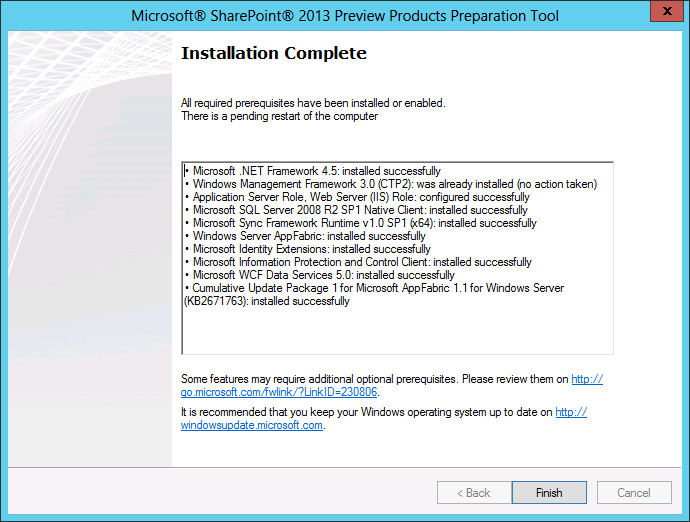 I missed to install it and therefore in the first try SharePoint 2013 Configuration Wizard refused to create the databases. At the first glance this is pretty far what we are used to from 2010. There is one new section on the lower end of the right column: Apps. The purpose of this new section is the management and monitoring of app catalogues and licenses. 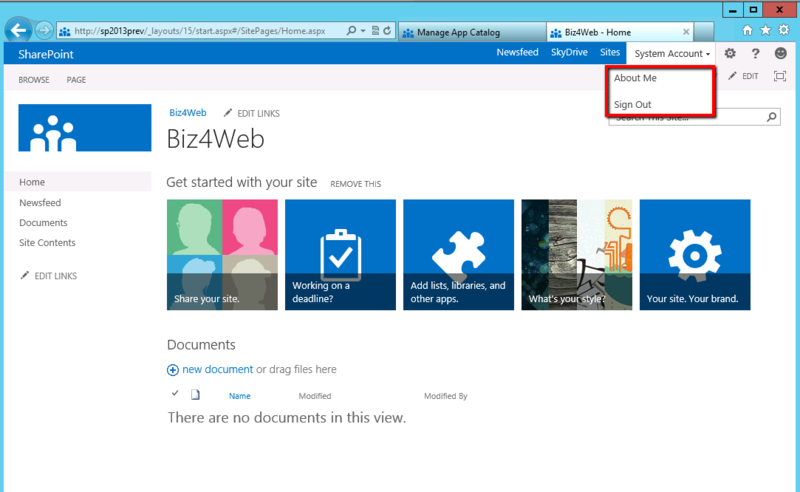 In the new 2013 experience version the option to sign in as a different user is not available per default. Since I am using this function to test the user experience from different points of view with different permissions, I was not very fond of that. But there is help. 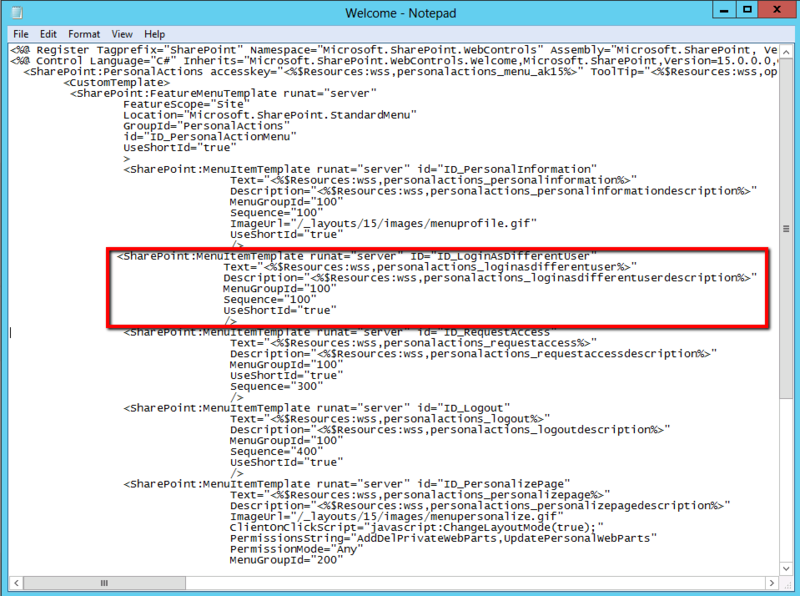 To add the menu item “Sign in as a Different User” back in, you have to locate the file \15\TEMPLATE\CONTROLTEMPLATES\Welcome.ascx and to open it in Notepad.